Home » Specials » Sneezy? Have you been feeling a little Grumpy lately? Do you wish you could fall asleep and be Sleepy all night long? And during the day, are your eyes itchy; are you Sneezy? You can’t take it anymore so you just want to be Happy. Though you’re caving into the dark side of drugs and you’re Bashful to admit it, you head to the Doc. A few pills later, even though you’re still Sneezy and Grumpy, you’re even more Sleepy and now you feel Dopey. That’s right. You’ve fallen under the spell of hay fever and spring allergies. 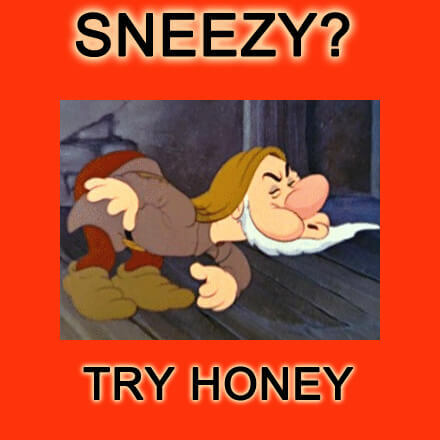 Is there a way out of the maze of sneezes and itchy eyes, coughs and wheezes without becoming Dopey? Well, honey is a popular non-drug, natural answer to hay fever. Honey. It’s sticky. It’s sweet. It’s nourishing. And you probably have some on your pantry shelf. But did you know it might be appropriate to keep some in the medicine cabinet? Honey has been called the “nectar of the gods” and has long been used for its medicinal and healing properties. And there are other gifts the generous honeybee provides us. Fossilized honeybees date back 50 million years. Man hasn’t been around that long, but there is certainly evidence that we have used honey and bee products for healing for millennia. Bees are the only insect producing a food that is useful to man. They are the only insect species that man has learned to colonize and domesticate. Pictoglyphs from ancient Egypt show the honeybee used as an important part of their ancient medical system. Pliny, Hippocrates, Galen and other classical ancient physicians all recognized the healing power of honey. Even though there are more things the bee does for us, honey is the one that most of us relate to. Honey is prepared in beehives by worker bees bringing nectar from flowers back to home base. It is a natural wonder and humans discovered honey in hives occurring in nature. Most of our modern supply of honey is produced in apiaries where bees store honey in wooden hives constructed by keepers. Bees are one of the most remarkable social species. Tireless workers, each doing for the good of the hive, the workers bring the essential nectar of about two million flowers to make each pound of honey. Drawing the nectar up, the bees fly home at around 12 miles per hour. Back in the hive, nectar is mixed with bee enzymes and stored as food for the colony. Honey is a perfect form of sugar. Unlike refined cane sugar, honey needs no digestion to be absorbed by the body. And honey isn’t exactly empty calories either. Honey is mostly made of complex carbohydrates but also contains some important vitamins, minerals, amino acids and antioxidants. Germs don’t grow in honey. Have you ever known a jar of honey to spoil? Nope. Honey found in urns located in 2500 year-old Egyptian tombs was found to be completely edible. Honey’s antibacterial and antifungal qualities are only the beginning of its use. Honey is more than food for humans. One of the most common medical uses throughout history has been to promote the healing of wounds and as an anti-microbial. Extensive research has shown that honey inhibits the growth of some of the deadliest bacteria known to man. One powerful study in India found honey to surpass the best topical burn medicine available in promoting healing and inhibiting infection. It is now used in combating the staphylococcus “superbugs” that are resistant to our most powerful antibiotic drugs. Although the United States is far behind the rest of the world in the use of honey as a wound dressing, we are catching up. As a systemic tonic, honey is found to help fight allergies, asthma, stomach ailments (including ulcers), respiratory problems and more. Significant studies show honey to have anti-tumor properties. Hippocrates’ suggestion of taking a spoon of honey to ease the stomach may have much to do with the success of honey in inhibiting the bacteria suspected in causing ulcers, H. pylori bacterium. Honey should be purchased “raw” and from local growers to be most effective. Raw simply means that the honey was not heated. Heating or pasteurizing honey destroys many of its beneficial qualities, including the enzyme that produces small amounts of the hydrogen peroxide in honey. That is one of the four crucial ways honey fights bacterial growth. Honey should also be unfiltered. Raw honey is also considered a natural way to fight plant allergies. Unfiltered honey will contain “de-activated” plant pollens and supposedly confer allergy immunity to local pollen. The best way to obtain honey is to shop locally at your nearest farmers market. Get to know your beekeeper and how the honey is sourced. You will find superior natural honey at economic savings. And, as a springtime bonus, you just might beat hay fever and stay away from Sneezy.